Mount Fuji is 3776 m high and its bee-line distance from the center of Tokyo is about 100 km, and so it is visible from Tokyo most of the time (often only its peak sticking out of the clouds, or on other times only its base without the peak, depending on where the holes in the cloud cover are at the moment). It has always played an important role in the traditional Japanese religion Shinto, which worships about six millions different gods, whose Japanese name is kami (here is a small selection from the kami pantheon). Almost everything can be a god, among others all Japanese mountains and hills have the status of gods, and some of the shrines built on their tops are dedicated to them. Thus Mount Fuji as the highest Japanese mountain, is an important god (known as Goddess Sengen-sama) in itself. In addition to that, the Sun Goddess Amaterasu (Amaterasu-Omikami), which has a very important place in the Shinto religion (right next to the rice gods), is being worshipped there. Japanese imperial family is according to the official state legends considered to be the direct descendants of the Amaterasu (and during the several months long enthronement process of a new emperor, which just took place at the time when I lived there, the new emperor spends one night symbolically in the company of Goddess Amaterasu, eating sacred rice from the sacred imperial paddy field). Part of the Sun Goddess worship is observing the sunrise from the top of a hill. The top of Mount Fuji is best suited for this purpose, and in earlier times every Japanese was obliged to climb there at least once in his/her life, and if possible every year. This gave rise to the tradition of night ascents to the top of Mount Fuji, which continues till now. (Present day Japanese are not very religious people. But at many shrines, ten thousands of which are scattered all over the Japanese mountains, some of them as small as a kennel or even smaller, sometimes even in quite remote places one can find fresh flowers or other offerings, such as mandarin oranges, rice cakes or 100 yen coins. Japanese simply continue rather diligently in observing many religious traditions as a way of preserving their cultural heritage. And also as a kind of insurance policy - why to antagonize the gods in case there is something to it after all.) The top of Mount Fuji is covered by snow for most of the year, and it is open to the public only during the summer months. At that time up to several thousands tourists climb there every night to fulfill their traditional pilgrimage to the rising sun. I joined those thousands on August 30, 1990 with a Japanese colleague and a guest researcher from Beijing. 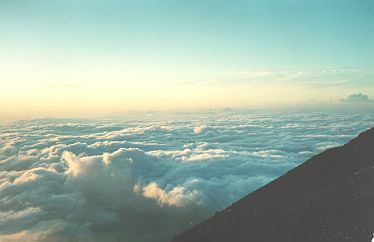 Nowadays the overnight pilgrimage to the top of Fuji is relatively easy. Up to the height of about 2000 m one can get on a bus. There one can also find the highest ring road around Fuji, and the last row of hotels and restaurants. After having a meal in one of them, we started our journey to the top at about 11 p.m. For the first few hours the visibility was perfect, and we had a breathtaking view on ever more and more illuminated towns and cities, hundreds of which are crammed in the plane around Tokyo. 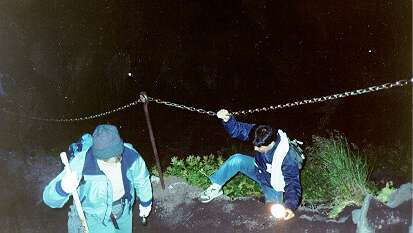 And also on the meandering and blinking snake of light created on the slope of Mount Fuji below and above us by the pocket torches used by many fellow climbers to illuminate the trail. It was not particularly visible in the photographs I made. In the first picture above you can see in the light of my flash only the two pilgrims that were immediately following us. Then when we were at about 3000 m, we suddenly got into the clouds. When we finally got above the layer of clouds, we were left only with the view of the star covered sky. Along the trail leading to the top, one can get refreshments in several simple tourist chalets, which sell all the night various favorite Japanese snacks, and mainly ama-sake (a kind of sake, the favorite Japanese rice liqueur), which is rather thick and has the color of milk, and is always served hot (but Japanese do not mind to warm up any kind of sake). Ama-sake has less alcohol than other kinds of sake, and it is sometimes considered a suitable drink also for children (in small quantities). In those chalets one could also rent sleeping bags (rather soiled by thousands of previous pilgrims), and have a short nap in them on large mats where it is not easy to find a free spot among other resting people. We have not used this service, but we have probably enjoyed ama-sake too often (it tastes good), and so when that famous sun rise was taking place at about 5:20 a.m., we were still only about 150 m below the highest point of Mount Fuji. 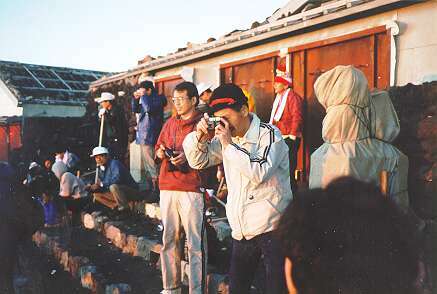 We were not the only ones who have not quite made it to the very top in time: in the second picture you can see other people observing the sunrise together with us protected from wind by the wall of one of many shrines that dot the edge of Mount Fuji crater (my two companions are in the foreground). What we have seen is shown in the last picture made only a few minutes after the sunrise, but showing well the see the clouds that were tightly surrounding the top of Mount Fuji on that morning. The view of one half of Japan, and of the vast expanses of the Pacific that I was looking forward to, did not simply take place then. From the hiking point of view, the ascent to the top of Fuji is not very demanding, and also not particularly interesting. Mount Fuji is a rather regular cone of volcanic ash, and the trail leading to the top is easy. At the top one can find a crater from which sulfurous gases are often being released (as from many other places all over Japan) but otherwise there has not been any volcanic activity there for a long time. On the edge of the crater is a large scientific observatory and many antennae. Around are many shrines and various sheds and dormitories and also a lot of garbage (at least in 1990 it was still there). When descending, we found that there is a dirty road leading right to the top used by heavy caterpillar vehicles hauling supplies to the top (all kinds of surprising things can be found in Japanese mountains). The surface of the road was loose volcanic ash, and one could run on it down the mountain quite easily. If you are interested, here is more on Goddess Amaterasu. Its cult is older than Christianity. Its main shrine at Ise in the south of Japan has been in continuous use for about 2000 years, since it was move there from elsewhere. Brief description of the early Japanese history and more on kami can be found here. Here is one of many other shrines dedicated to Amaterasu. Of course, I do not worship the Sun as a god. But, as many other people, I like to watch as it rises in the morning. It is the nuclear reaction going inside the Sun that makes our lives possible, anyway. No wonder that we are so attracted to this miracle of the nature.